Taking Italy step by step means you can make the most out of landscape where there is simply so much to absorb yourself in. Following Italy’s hiking routes, you’ll find towns, villages and great swathes of rolling countryside steeped in history, culture and the deep-rooted traditions of the local people. With more UNESCO world heritage sites than anywhere on earth, you’ll experience a profound sense of diversity between each region, with the geography, culture and cuisine promising much in the way of discovery. 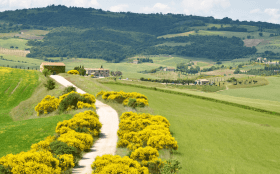 From the vineyards of Piedmont and Tuscany to the clifftop routes of the Western coast and Puglia, walking in Italy offers the chance to take a breather, tune out and enjoy the picturesque surroundings of Bella Italia. From the alpine, vineyard paths of the north, the quiet country lanes of Tuscany and the clifftop paths of the south, walking Italy is the insiders tip for seeing the best of a beautiful country without the crowds and queuing that comes with its popular status. 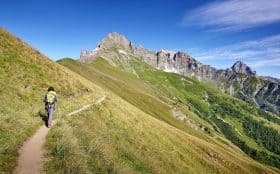 Though Italy is not commonly thought of as a hiking destination, the country in fact holds a comprehensive network of trails, and you could argue that visiting Italy becomes a more magical experience once you leave the city, with the traditional life and landscape of the countryside open for discovery. 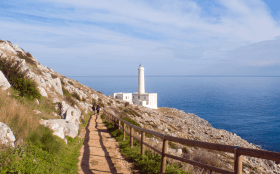 Routes have their background in the life of the area, with ancient droving trails formerly used by shepherds (traturri) and clifftop paths formerly used for trading between the area’s villages. 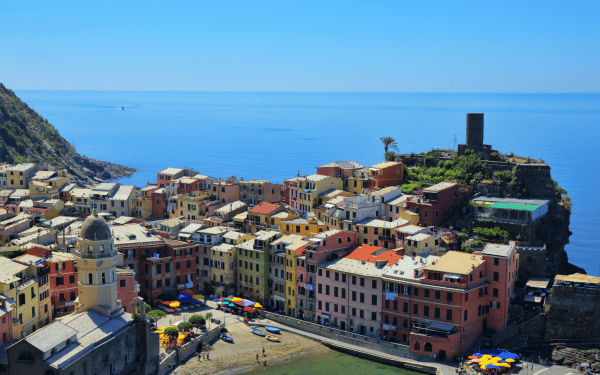 Italy enjoys some of the most radiant weather found while travelling in Europe, and there’s a great deal of diversity in climate to be found across its provinces. Before you set off, its best practice to consider a number of factors that could impact your walking experience. 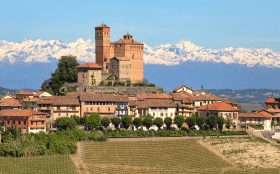 If you’re planning on setting off during July and August, you may want to consider walking in Piedmont, with the alpine area being considerably less sweltering than its more southerly neighbours, as well as less busy overall. Although this is especially the case in Amalfi and the Cinque Terre National Park, you may find that taking to the hiking trails promises a more peaceful and natural environment than the area’s busy beaches. Celtic Trails transports all luggage, and books all accommodation and taxi transfers as standard. Transport to and from the start of your walk is not included, but we are more than happy to advise on the best ways to get there. By Plane – As you may expect from a country with a booming tourist industry, flights to and from Italy are frequent and cover broad swathes of the country. There are frequent internal flight to smaller airports, though you’ll find that the range of airports being visited by international destinations is greater than ever. If you’re travelling in from the UK, you can expect your flight to take around 2-3 hours. Visitors from the US can expect a flight to Italy to last around 11-13 hours, and from Australia, approximately 20-22 hours. By Train – Taking a train from most places in the UK and the continent will necessitate taking a journey over two days. That being said, it is possible to travel from London to Turin (in the North, between Genoa and Milan) over the course of a single day. EU citizens are free to visit Italy for any length of time with just their passport, Americans, Canadians, Australians, New Zealanders, etc. can stay up to 90 days. Most non-EU citizens will not require a visa to enter Italy, it is however best policy to check your travel status first. By Train – Travelling by train in in Italy is by far the most time efficient and comfortable way of getting from city to town to city across the Italian landscape. We advise buying your ticket for point to point at a ticket terminal. First class options are available, where snacks and glass of prosecco are included. If you’re only planning on taking the train between the start/end of your walk and the airport, then getting a rail pass isn’t great value. However, if you’re planning on exploring the country further after your walking holiday most rail passes will prove to be the more economical option. The best way to find out is to consult the Italia Rail website. The majority of trains in Italy (Trenitalia) are owned and run by the state, who operate both regional and long-distance train services. There is a perceptible difference between these two services, with the high-speed long distance trains (known as Frecciarossa) noticeably more modern than their regional equivalent. By Bus – Buses are the economical option in Italy, if you’re prepared to spend more time in transit. Buses, or in fact taxis are sometimes the only option when visiting places that are a bit more off the beaten track. Italy’s most prominent bus companies are run under one umbrella company, Ibus, with the notable exception being Motorway, which operates in the North of the country. There are long-distance bus services between regions, primarily as links to tourist destinations. Long-distanc services come equipped with wi-fi, televisions, toilets and large luggage storage. Urban bus services are equipped with basic facilities in comparison (e.g. less room to store luggage), and are mainly used for a ‘hop on, hop off’ approach to seeing the city. Taxi – Even in the more rural areas of Italy, taxis are a convenient (though more costly) alternative to taking the bus. While you’re out on your walking holiday, taxi transfers (where necessary) from your accommodation to the path are included as part of the price. Though the many Italians you meet working in the main tourists towns and cities will be likely to speak English, it's considered polite to put your requests in Italian. Most will appreciate the effort, and switch the exchange to English if they can see that you’re struggling. Please bear in mind that in more remote and less populous communities, you'll be less likely to be able to converse in English, especially with older generations. As is often the case with travelling to a new country, a few handy phrases and a dictionary (mainly for purposes of vocabulary) can get you a long way. As with your own language, a simple change in the way you phrase requests can elicit a much more favourable response. Subtle differences like ‘posso avere un bicchiere di vino?’ (could I have a glass of wine?) rather than ‘voglio un bicchiere di vino’ (I want a glass of wine) creates a much more considerate impression. It’s a fact that Italian cuisine is one of the countries mostt famous cultural exports, and there’s no better way to try some of the countries more celebrated dishes than in their place of origin. 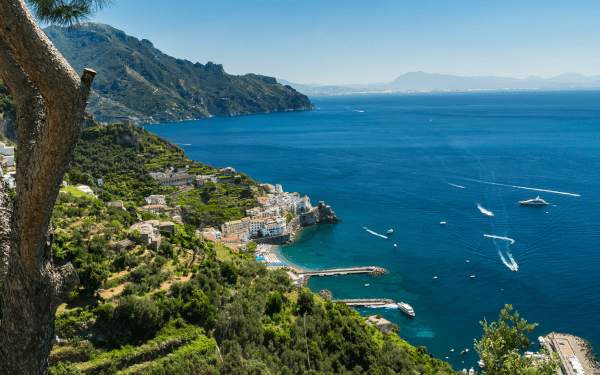 A visit to somewhere like Amalfi wouldn’t be complete without trying pizza in the area in which it was first made, and while you’re visiting Positano (on the Amalfi Coast), the Pizzeria Ristorante Saraceno d'Oro or the Ristorante il Fornillo ae both fantastic choices for pizza rustica. Differences in cuisine can vary quite dramatically between localities, and its not uncommon for communes and small towns to hold festivals (sagre) celebrating the most famous dish/ingredient of their region. With over 350 indigenous varieties of wine across Italy alone, picking the best bottle can be an intimidating prospect. Even so, having a rough idea of what to look for should put you in good stead. 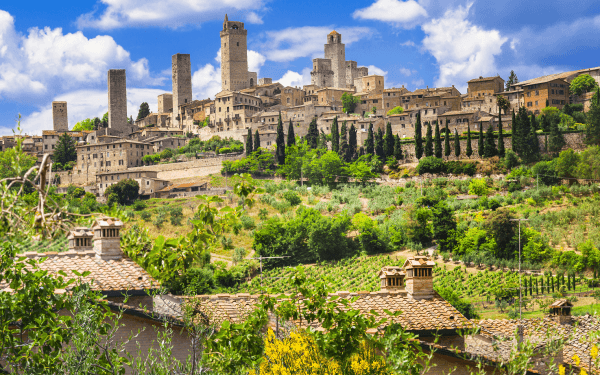 Sometimes sticking to the classics is the best policy, and walkers in Tuscany may be aware of the famous Chianti and Brunello wines produced in the region. 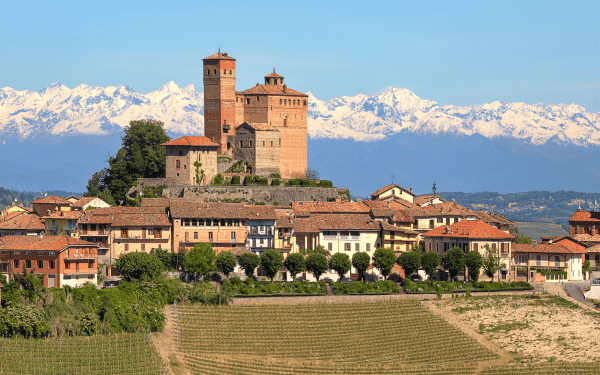 Further north in Piedmont, you’ll find the celebrated Barolo wine, produced in the Langhe region. The vineyards of these regions are a common fixture of the countryside, and you can experience the satisfaction of exploring the very landscapes where these prestigious wines are produced. A good indicator of quality is the DOCG (translated as: controlled and guaranteed designation of origin) label emblazoned on the bottle - a guarantee that a traditional set of processes and ingredients have gone into the wine’s production. Italy is one of the most diverse countries you can hope to visit, with a lot to offer in terms of culture, geography and activities. No matter where you wander across the country, you can be assured that there is somewhere special to visit or spend a few days out exploring, following the end of your journey. Looking for a island retreat? Well then look no further than Sardinia (flights to Caligari), or the Aeolian Isles (just off the coast of Sicily), and if its rich history and culture you’re after, then why not extend a walking break in Tuscany with a visit to the city of Florence or Pisa? Italy uses the Euro. Most shops, hotels and restaurants accept all major debit and credit cards, although you should always carry a bit of cash on you, particularly when visiting more rural areas or when using small businesses. You will also find an ATM in most small towns. Tipping in most cafes and restaurants is not mandatory, most establishments will include a tip as part of the servizio (service charge) on your restaurant bill and/or the coperto (cover charge). Where this isn’t the case, anything between 5% and 15%, depending on the quality of service is acceptable. It is not necessary to tip bar staff as you will usually order and collect your drinks at the bar. New EU legislation means that normal rates on what were called ‘roaming charges’, have been slashed significantly, which means you won't be charged any extra fees to use your UK allowance of minutes, texts or (most) data in the EU. However if you your mobile phone packages data quite frequently, you may be charged significantly when not connected to free wi-fi. If you’re travelling from outside the EU, or use data on your phone quite often, you may want to consider buying an Italian sim card as this can be quite handy for finding museum hours, booking tables and calling taxis. Whilst phone and internet coverage across Italian cities is generally good, with 4G rolled out successfully across communities in recent years, be aware that rural areas may have limited coverage. For this reason it is best to plan ahead and not rely on them when you are out and about. In towns and villages there will generally be phone reception but not always mobile internet. It is increasingly common to have free wi-fi in cafes, hotels and B&Bs, but not guaranteed. Healthcare systems vary from one country to the next and may not include everything you expect to be free of charge where you come from. EU nationals can use their European Health Insurance Card (EHIC) to access the necessary state-provided healthcare in Italy at a reduced cost, or even for free. The EHIC card also covers pre-existing medical conditions, though not for anyone travelling with the express purpose of seeking medical treatment. Emergency numbers and contacts are included as part of your walk pack.